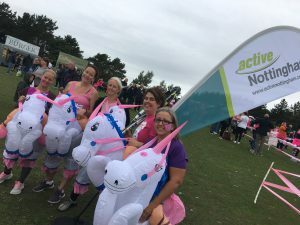 Saturday 8 September saw hundreds of pink clad tutu’d ladies, and a few unicorns! 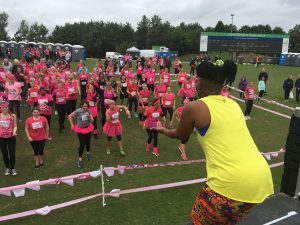 gather at Holme Pierrepont for this year’s Pretty Muddy Race for Life in aid of Cancer Research UK. Active Nottingham had a corporate time slot or “wave” all to ourselves which meant that 200 staff and customers many of who are Flexible Fitness members from our 8 leisure centres all ran together and tackled the obstacles as a team to help raise money for such a great cause. We were amazed at how many of our customers took part, and we want to say a big THANK YOU! After an awesome warm up led by non other that Charm of Zumba with Charm, which got everyone in the spirit, they were ready for the off! There was a real buzz as everyone crossed the start line and headed off to the first obstacle. Event staff around the course were brilliant, as they supported and encouraged everyone to get as muddy as possible and have fun! The race (not that it really is one) culminates in a rope climb and slide into a mud pit, which really made sure that everyone was covered by the time they crossed the finish line to be congratulated by friends and family that had gathered to cheer them on. Everyone had a wonderful time and even though it was a little chilly, everyone was proud to show off their medals at the end and many visited our stall for their free Fitness and Tennis passes. 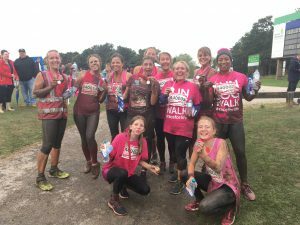 We all know someone who’s touched by cancer and doing something like Pretty Muddy Race for Life is a great way of showing our support. Will we be doing it again next year……you bet! Here’s Lorna, the event organiser from Cancer Research UK, with a special message for every one of our Active Nottingham Muddy Maidens!